1) Blind auction of the Hounds game-worn, limited edition, jerseys from the February 2 game. In-arena auction begins on Wednesday, January 31 (vs Sudbury Wolves) and will be open again on Friday, February 2 until the conclusion of the 1st Intermission. Online bidding is open NOW and will close on Tuesday, January 30 at 5 p.m. To bid online CLICK HERE. 2) Limited special edition “Hockey Fights Cancer” T-Shirts will be available at the Hound Pound starting January 26 – $5 from every t-shirt will go towards the fundraising campaign. 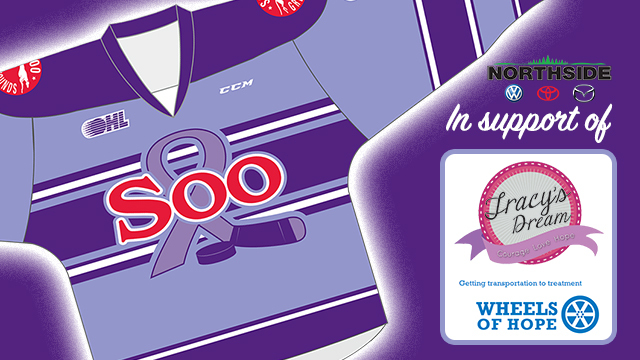 3)Tracy’s Dream will be attending the January 31st game, as well as the February 2nd Hockey Fights Cancer game. Their 2018 calendar will be available for purchase on the concourse level behind section 106. All proceeds from the calendar directly support Tracy’s Dream.